These include Aeridies, Angreacum, Ascocenda, Ascocentrum, Neostylis, Rhynchostylis, Stauropsis, Vanda, and similar. 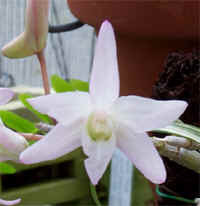 This type of orchid likes strong filtered light. These also will lean toward the light when the light is not strong enough. They like large temperature swings, which causes them to want to bloom. They typically are in baskets and normally do not have bark mix so they require watering more often. It is best to water your in the early morning and water the Vandeae first and last. When you water, water till the roots turn green and then let them return to white before you water again. In the summer time that could mean daily watering and in the winter every few days. 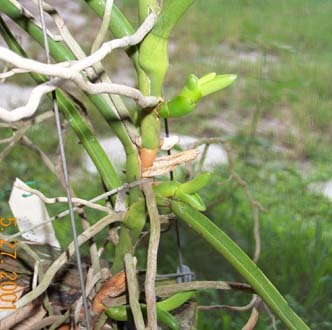 This is another plant that should not to be watered at night, late watering has been the death of a large number of these orchids. You should always have good root tips and leaf growth on your Vandeae. We keep our Vandeae over 55 degrees and high's below the mid 90‘s. We have had great success in my small greenhouse getting these plants to bloom often. People have great success with these in screen pool enclosures, greenhouses and hanging in branches under trees. Vandeae also get Keiki's but they are usually on the side of the plant. 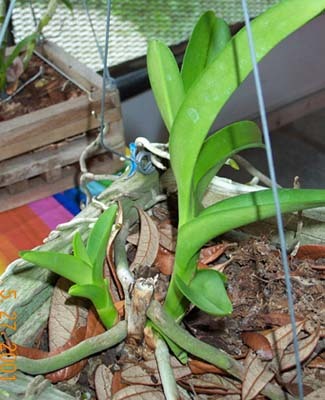 These Keiki's can also be removed when the roots are about 3 or 4 inches long but more care is needed so that you do not damage the parent plant. Vandeae also can be "topped" which is a way to aquire additional plants. If you have a Vandeae that has several roots growing from the middle of the plant you can cut the plant below the point where you have 3 or 4 roots that are about 5 to 6 inches long. You must have good roots for this to work. The interesting fact is that the portion left behind will not have to even have leaves for the plant to begin to grow kiekies. As with all orchids make sure you sterilize the cutting tool in a flame prior to use. This image shows good root growth. This shows kiekies that are forming on a Vanda. The base of a "topped" Vanda.